The freshman Viper, made by Henrys of Germany, was the more expensive--and heavier--aluminum-hubbed version of the plastic-hubbed Cobra Ice. This model was released in 1998 and used a size D ball bearing axle. All Vipers before May 1999 were incompatible with the new Henrys AXYS system that came out in the Spring of 1999. AXYS was a modular system of four different axles that were completely interchangable with Henrys' entire yo-yo product line at the time. (An updated Viper, version 2 model was released in the summer of 1999 to accommodate the new axle system.) 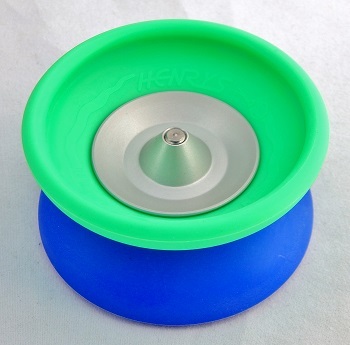 As with all Henrys yo-yos back then, the string gap was completely adjustable by slightly rotating the halves. Henrys called their string gap adjustment capability Quicktrick. The original 1998 release of Henrys Viper did not have a response system of any kind. Compare with the Bandai Hyper Viper.